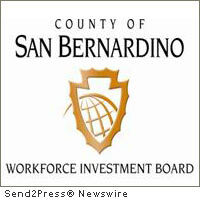 SAN BERNARDINO, Calif., Aug. 31, 2011 (SEND2PRESS NEWSWIRE) — The San Bernardino County Workforce Investment Board is helping companies keep manufacturing jobs in California. Six months after taking advantage of a Lean Manufacturing Program funded by the Workforce Investment Board, local employer A&R Tarpaulins has added three positions, including one inventory manager and two entry level engineers, and is still growing. A&R is better aligned for sustainable growth since implementing process improvements recommended by California Manufacturing Technology Consulting(R) (CMTC). The lean process training identified where they could use staff more effectively and reduce waste in their processes. Nearly all of A&R’s workforce participated in the program and received graduate certificates. A&R manufactures fabric products for the trucking, aerospace and architectural industries. The Fontana, California based company recently received a 2010 Small Business Recognition Award from United Launch Alliance. The Workforce Investment Board’s partnership with CMTC, and others like it, is federally-funded and free to employers who participate. The Workforce Investment Board’s business resource team brings funding to businesses for employee training, whether to upgrade the skills of existing employees or hire and train new employees through subsidized and on-the-job training programs. It also offers help with recruiting qualified employees, business consulting, job fairs, market research and business workshops. The Business Resource Team can be reached by calling 800-451-JOBS. A private, nonprofit corporation established in 1992, CMTC is an affiliate of NIST MEP, under the Hollings Manufacturing Extension Partnership (MEP) program, a network of more than 60 centers across the country that provide assistance to small, medium and large manufacturers. CMTC serves Fresno to San Diego/Imperial County. For more information, visit www.cmtc.com . Original Keywords: Sandy Harmsen, California Manufacturing Technology Consulting, hire and train new employees through subsidized and on-the-job training programs, Lean Manufacturing Program Workforce Investment Board of San Bernardino County San Bernardino California SAN BERNARDINO, Calif.
REFERENCES: Business News, Sandy Harmsen, California Manufacturing Technology Consulting, hire and train new employees through subsidized and on-the-job training programs, Lean Manufacturing Program Workforce Investment Board of San Bernardino County San Bernardino California SAN BERNARDINO, Calif.